Currently a stay-at-home mother, EJ is also a licensed professional counselor who specialized in youth and family counseling. She has worked with high-risk youth for over a decade, seven of those years being with Colorado’s Division of Youth Corrections (DYC). She believes in the HOPE of Christ for each of the youth that find themselves in the system. While she plans on returning to DYC soon, she currently enjoys training volunteers and the local church on how to best work with this high-risk population. We recently had the opportunity to chat with EJ about her experience within the Division of Youth Corrections and the impact Denver Youth for Christ is having on kids within the system. Denver Youth for Christ: In your role with the Division of Youth Corrections, what have you heard about Denver YFC and our Juvenile Justice Ministries program? I worked with incarcerated girls who could not say enough about their positive experiences with Claire, the chaplain at our main girls’ program. They did not feel judged by her or preached at, they felt heard and cared about. Fast forward a few years later to when I was a stay at home mom, I learned through KLove that YFC raised money each December to give Christmas gifts to every DYC (Division of Youth Corrections) youth and was blown away. Despite these kids being in facilities due to their criminal behaviors, they are still kids, and hearing that a Christian ministry recognized this gave me hope! For these kids, being away from their families during the holidays is really hard. There are kids in DYC who don’t have family or a support system, so being thought of and given gifts at Christmastime is HUGE. Soon after that, I learned that YFC had started to provide mentors to the youth. I was so moved! The thought of believers walking along side these kids blew me away. This is the church truly being the church. Last year I wanted to continue to work with high-risk youth in some way so I decided to get involved with YFC. I went to a mentoring orientation at YFC and I was amazed at the caliber of the volunteers and the quality of the training YFC provided to their mentors. YFC staff have a clear sense of what it means to work with high-risk youth. They are not naïve or cynical, both of which are easy to become with this population. They are also invested in equipping their volunteers to effectively minister to a tough population and communicate hope and peace in a difficult environment. I’ve been super impressed with the mentors I’ve met too. Working with incarcerated youth is not for the faint of heart, and hearing how God had led each person in that room to this ministry gave me such excitement about what God is doing in DYC! When plans changed and I was asked to provide some training to the mentors, I reached out to some colleagues in DYC for resources. Despite my belief that they may not be believers themselves, they were wholeheartedly behind the endeavor, which honestly surprised me. I quickly learned that it was because they had had positive experiences with YFC that made them receptive to my request. One even told me how impressed she was every time she had been to the YFC office and felt strongly about the quality of YFC staff. There is something so powerful and grace-oriented about Youth for Christ that even those who tend to be cynical about faith-based ministries and Christians see that you’re different. Denver Youth for Christ: Why is it so important to have Denver YFC and Juvenile Justice Ministries a part of the Division of Youth Corrections and this high-risk youth population? EJ: Like I mentioned before, many of these kids have little to no support systems or their support systems need reinforcement. There’s a lot of brokenness and darkness in these lives and YFC brings Jesus’ light and hope. On a practical note, YFC has done a great job meeting practical needs too. They provide Christmas gifts, come alongside youth and their families in times of crisis, provide rides when needed, and offer a listening ear. Staff do their best to meet the needs of all of the youth, but there is so much need that they cannot do it alone. Also, due to policy guidelines, contact between youth and state facility staff is minimal to non-existent once the youth leave the facility. That means a big part of the youth’s positive support for up to two years is off limits to them now that they’re back in the community trying to put what they learned into practice. The YFC mentoring relationship is uniquely suited to help support youth starting while these young people are in the facilities but continuing while they transitions home or into the local community. 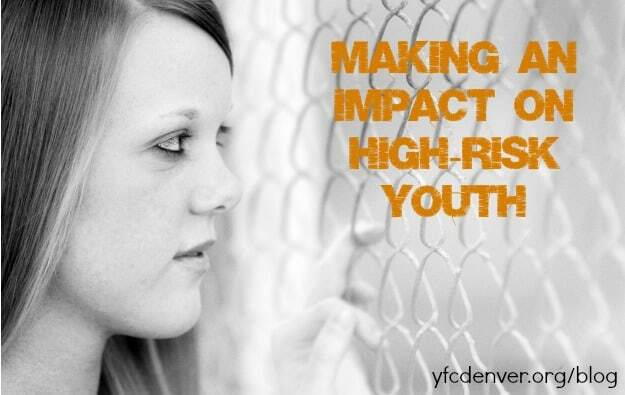 Denver Youth for Christ: What would happen if YFC wasn’t in Colorado’s Division of Youth Corrections? While there are believers who work in DYC, many more are needed to bring hope, faith and light to the youth and to the staff there. It is also huge to these kids that the mentors are volunteers. They discount much of what staff say or do because we get paid to care. High risk youth would feel more alone or forgotten by society at large. Their support systems would also be weaker. Kids may not hear about God’s love for them and His power to take any horrible situation and redeem it. High risk youth would be much less likely to seek out believers or churches when in crisis in the community because they would not have previously had a positive, genuine experience with a Christian.